Five of our members will again take part in Festival of Crafts at Farnham Maltings under the Surrey Guild banner. Moved from mid October to the end of the month, the organisers tell us visitor numbers have increased, so we are all looking forward to seeing lots of new and returning faces over the weekend of October 27th and 28th. Linda Connelly, Colleen Higham, Gabriella Sellors, Nancy Shafee and Caroline Wiltshire will be the members to look out for, each demonstrating and talking to visitors about how they make their wonderful creations. 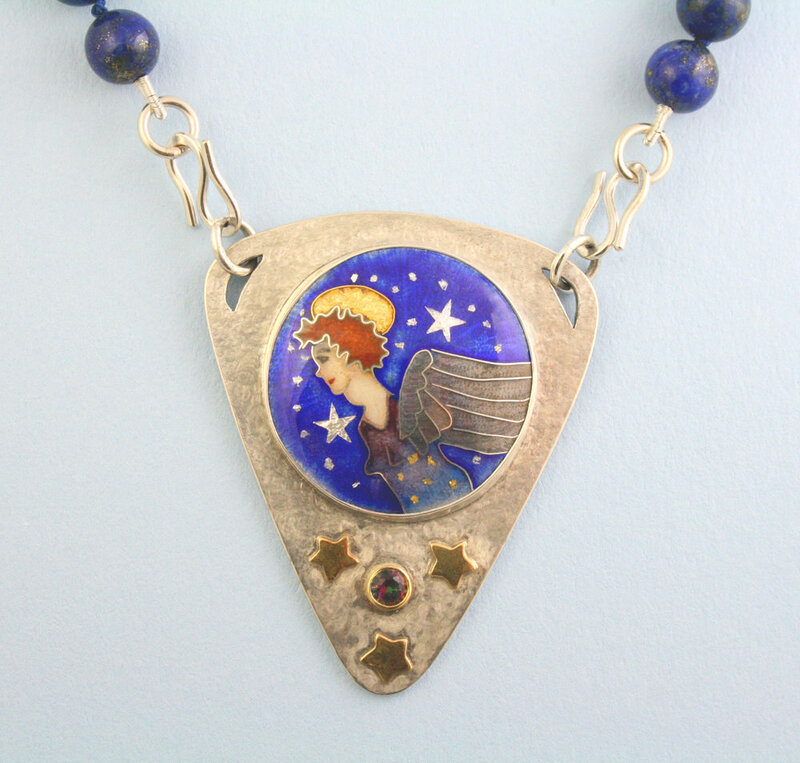 For example, you will have the opportunity to see Linda Connelly work her magic with enamels - alchemy! Vibrant colours, detailed designs and all sorts of goodies from jewellery to clocks are sure to tempt buyers looking for gifts. One of our newer members, Colleen Higham, will amaze you with what can be done with coloured cords and beads. She will be demonstrating the art of kumihimo to make intricate cords, necklaces and bracelets - and again her use of colour just draws you in to say ‘must have’! Energetic Colleen has also just taken over Arty Crafty in Godalming, so you can pop in and see her there for all your own crafting needs. Visitors to past events may have seen Gabriella Sellors adding texture to silver pieces she has cut into circles, flowers and leaves. It is fascinating to watch how a plain sheet of silver can take on the texture of linen or the fine lines of veins in leaves. Even her super-fine links are textured! Gabriella often adds pearls and semi precious stones to her jewellery - ageless, dateless, timeless. If you have been to Festival of Craft in the past, you may well have seen Nancy Shafee demonstrating how she makes coiled baskets from upcycled silks and cottons as well as handfelted items, notably poppies. Over the past year Nancy has been working with a completely new material - plaster - and instead of her bright textiles you will find her showing her fine bas-relief plaster casts depicting hedgerow finds under the selling name Charles Cottage Studio. And almost all are just white! Caroline Wiltshire is another jewellery member, using the tiniest glass and crystal beads to create intricate sparkly jewellery, a great favourite with visitors to our gallery in Milford. She also ‘knits’ with coloured and natural silver wires making delicate bracelets. Member Fee Fraser will also be at Festival of Craft, selling her work but not demonstrating.